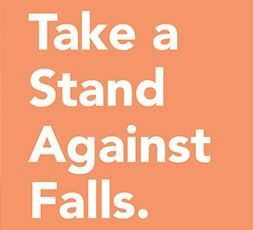 Falls lead the way when it comes to injuries, both fatal and non-fatal, among adults 65 and older. What can be done around their home to minimize the risk? Everyone knows about the obvious things: eliminate clutter, manage electrical cords, ensure adequate lighting and secured railings. But what about a few other things we take for granted when we’re younger, when we still have strong eyesight and good stability? Like the last step before you reach the basement. Did you know that many seniors have trouble judging distance, which means a painted basement step that doesn’t contrast well against the floor can be dangerous? Don’t think a fall always has to be a tumble down a full flight of stairs, falls can happen anywhere, and they happen quickly. Perhaps your mom was doing laundry and was having trouble hefting that huge bottle of liquid detergent. A few drops ended up on the floor. Next thing you know, Mom is on the floor too. You have to put yourself in their shoes, remembering the declining eyesight, along with less strength and stability. I recommend people walk throughout the home and simulate the activities your parents go through each day. Using the bathroom, taking a shower, getting dressed, preparing meals. Envision yourself as your parent, which of these tasks seem challenging? Are there proper grab bars near the toilet and tub? Is the tub easy to get in and out of, does it have anti-slip coating or fresh decals? How about access to cabinets and cupboards? Are things too high? Too low? Do this in every room, including the garage and outside the home. But pay special attention to the bathroom and the kitchen, because statistically these two rooms combine for approximately 80% of injuries at home. If you throw in the bedroom, that statistic climbs to over 90%. It’s important to give consideration to the clinical aspects of fall prevention as well. If you’re at all concerned about your aging parents’ risk to fall, receiving a gait, strength and balance assessment along with a physician’s medication review are extremely important. Supplements can also help, not only improving strength, but providing for stronger bones to better withstand a fall. One last thing: take mom’s favorite throw rug, the one she refuses to get rid of, and turn it into a decorative wall hanging. A simple trick that could save her life. Clayton and his wife Paula are owners of Arista Home Care Solutions, and elderly home care company, serving families throughout the greater Toledo area, including Lucas, Wood & Fulton counties in Ohio and Monroe and Lenawee counties in Michigan. They are an active part of our community, having raised their six children locally, while regularly volunteering their time to help seniors and others in need. Their goal, first and foremost, is to provide a personal level of professional care for every client they serve.